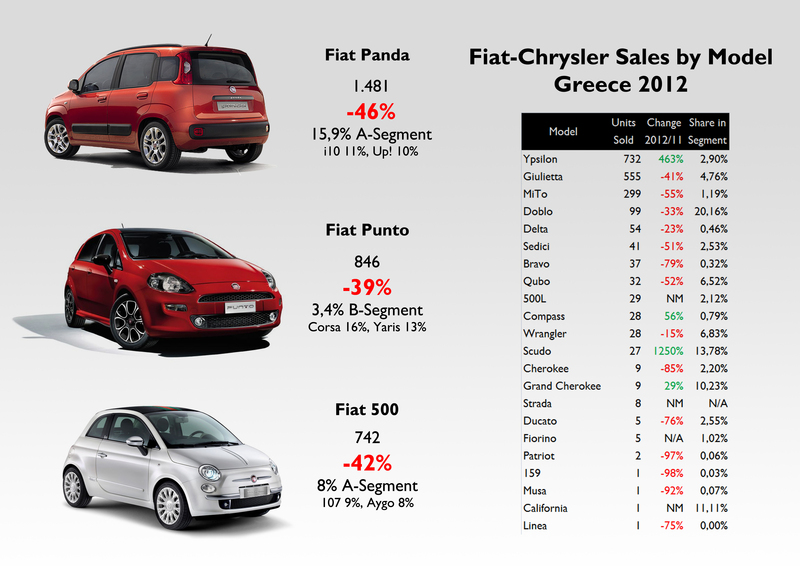 The Greek car market had probably the worst fall in terms of sales in the whole world. At least from my data base, in which I have the change 2012-2011 for 67 countries, Greece had the deepest fall. There were 58.500 units sold, down an incredible 40%! Certainly, the recession, austerity measures and the social instability have had a direct impact on car sales. A market that moved around 300.000 units/year 5 years ago, has been reduced to a very small and competitive place for those who resist. Greek car market is now smaller than Romanian, or Slovak ones, and gets close to Luxembourg, where 50.000 units were sold in 2012 and has a 20 times smaller population. As usual, the leader is VW Group with 20% share, followed by GM and PSA (which had a great performance thanks to the new 208). The regular strong groups in Europe, VW and Hyundai, had bigger falls than overall market. Fiat-Chrysler occupies a decent position falling ‘only’ 37%, making of it the second best-performer among major car makers, after PSA. The market survives thanks to B-Segment cars (Yaris, C3, 208, Polo, Fiesta), which is the preferred by rent-a-car agencies. But ALL segments sales decreased. Curiously, the supersport cars (E-Sport) had the lowest fall (-10%) in a country that struggles against increasing poverty and unemployment. Fiat-Chrysler owns almost 9% of the market, which is a great result considered the crisis and its market share in other European markets. Hence, Greece is Fiat’s second best market in Western Europe in terms of share (Macedonia, San Marino, and Serbia are above). In such a context, Lancia was able to more than triple its sales, thanks to the success of the Ypsilon. 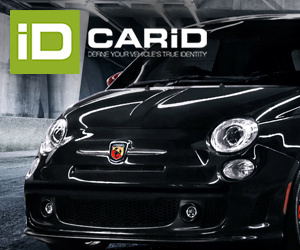 Fiat brand saw how its sales reduced by 2.500 units (-43%), with the Panda toping sales and fall (-46%). Alfa Romeo’s results were another disaster: down 49%, with both models shrinking. The same happened to Jeep (-65%), while Ferrari registered 1 car sold. The passenger version of the Doblo manages to catch 20% of its segment, just as its older brother, the Scudo with 14% share. The new Panda controls a not bad 16% of its segment, while the Giulietta occupies a good position in C-Segment. 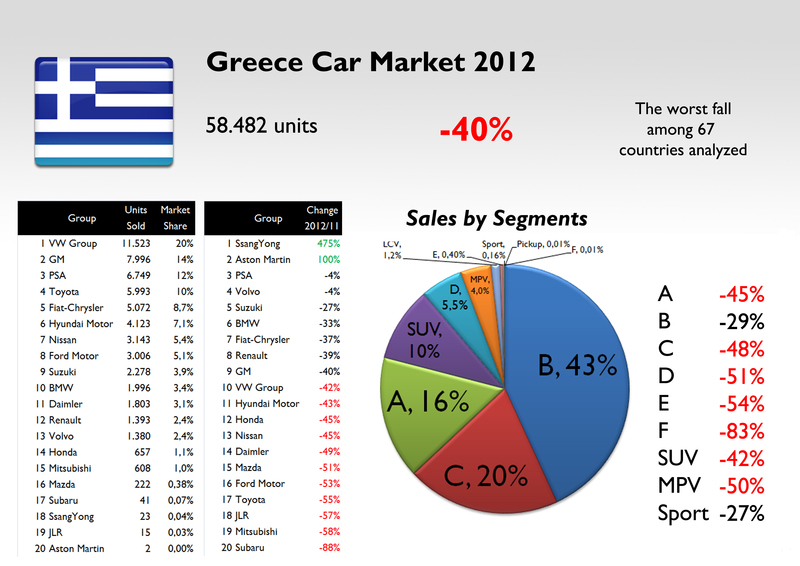 Greek car market is expected to stabilize in 2013. The market may grow a little bit this year but nothing big is expected. Fiat Group should remain stable and maybe increase its presence in B-MPV segment with the new 500L. 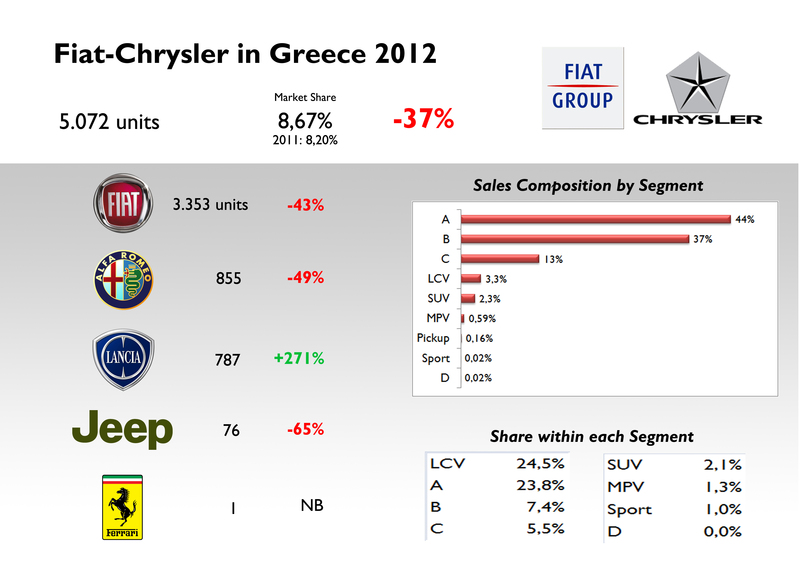 Forecast 2013 Fiat-Chrysler in Greece: 5.500 units. I see Lancia is doing quite good in Greece.